Picture Framing Blog - A Good Frame of Mind: QuickShop is Here! Today we’re launching Phase I of QuickShop. Take a look! QuickShop is a fast and easy ordering interface for customers who know exactly which products they need from our site. No scrolling, no searching, no fuss. Enjoy easy 3 click ordering. Let’s say you use Standard Matte Black (Nielsen#11) and you know from experience that the product code is S21. Let’s also assume you just need to order 10, 18 x 24 frames and move on! Simply go to QuickShop, enter S21, input 18 & 24, and add to cart. Voila! 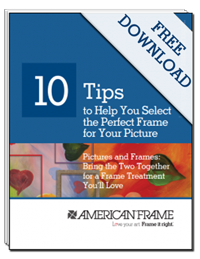 – Your frames are ordered in 3 clicks! Taking another example, let’s say you only need a few cut sheets of mat board and you always use CS9502 White Sale. Go to QuickShop, put in your product number, enter your dimensions and add to cart. Again, 3 clicks! Just enter and go! This same functionality applies to all accessories and picture frame tools & supplies. Simply enter the product number, click and buy. What’s the difference between QuickShop and our normal ordering process? The QuickShop workflow isn’t designed with frame kits in mind (although you can certainly build one if you’d like). Within our normal order flow, we provide a frame design tool where full kits are pre-built and include a default mat board, acrylic and backing board which can be changed within the order flow. Before Quickshop, professionals who didn’t necessarily need design assistance or full kits were required to deselect unwanted kit components. Alternatively, QuickShop offers a faster way to only order the exact materials needed, either individually or in a kit. Within the next week or so, Phase II will be up and running that will allow for a quicker way to change frames and change mat boards within both the QuickShop and normal ordering flow. QuickShop is located at the bottom of our left navigation bar on the home page. Very shortly, there will be a prominent link from the top navigation tab which is being re-designed as well. Please let me know what you think by commenting here or emailing me at lauraj@americanframe.com. As always, I appreciate your input.